Welcome to WikiMohamadia! : How to reach Penang Island from Butterworth economically? How to reach Penang Island from Butterworth economically? Butterworth is a town in the Penang state. Penang is a very famous place for tourist attraction. Of course, Penang is very beautiful and clean city. We had been to Penang several times and love its greenery, beautiful landscape and its enchanting natural scenery. Butterworth is connected to Penang via a long bridge of approximately 13 kms. Travelling on this bridge is another great experience. Butterwort city has also many attractions for tourist including some historical places. So, there are two ways to travel to Penang from Butterworth either by road or by ferry. In this post, I am going to discuss about the water transport, i.e. the ferry from Butterworth. The taxi fare from Butterworth to Penang is very high as compared to the fare of ferry. In addition, one can enjoy the experience of travelling in ferry in the vast sea of Penang island. Isn’t it adventurous? But, you need a little patience to travel by ferry because the ferry timings are not fixed and it arrives between 30-45 minutes. You are lucky if you are the last person on the ferry when it is leaving with no need to wait and not lucky if you have just arrived and the ferry is leaving. Because, you have to wait maximum time for ferry as compared to others arriving later. Anyhow, one can pass the time browsing on mobile, as there is free wifi facility available in the waiting area. There are no fixed timings but the first and last ferry has. The first ferry departs at morning 5.20 AM and the last departs at 12.40 AM in the mid-night. The fare is very cheap, RM 1.20 for adults and RM 0.60 for kids. The other way round, while returning from Penang to Butterworth it is free of cost. It is better if you carry coins, as you need to put the coins at the entrance for the automatic gate-bar to open. This will be very useful, if the ferry is leaving and you want to get in it. No problem, if you didn’t carry coin as there is a coin exchanger just at the entrance, but if there exist a long queue you may lose the ferry. Hence, it’s advised to carry the coins. The ferry provides seating arrangement for the passengers and it is equipped with life jackets placed at racks as a safety feature. It has maximum transport of capacity of 300 people at one time. 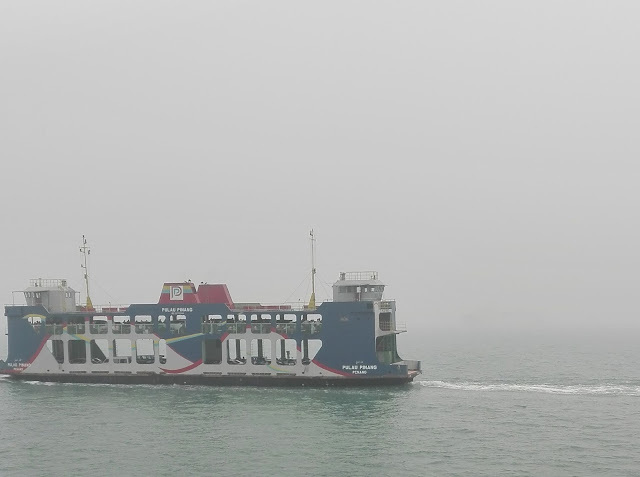 The ferry will take you to Penang in just 15 minutes. During the short span of time one can enjoy the open-air breeze from the waves, also can click beautiful scenes using camera or mobile phone. At the arrival, furthermore exciting thing is that you have reached Little India, one of the famous tourist spots. If you hire a taxi from Butterworth to Little India it will take approximately 45-60 minutes to reach with a fare around RM 80, which is nearly 80 times high compared to the the fare of ferry. Hence, one can travel economically by ferry! The only thing that might be little perturbing is the 10-15 minute walk from Butterworth bus terminal to the Ferry point. Climbing upstairs and the long pavement may be painful for old age people.